Aniakchak National Monument may be best known for its status as the country’s least visited national park site, seeing only 134 visitors in 2014. It’s not only remote, accessible by a long journey of flying, boating, and/or backpacking. but it’s also a rugged, difficult environment, with foggy, rainy weather and a high concentration of bears and wolves. Aniakchak is a 6-mile-wide caldera, 2,000 feet from rim to basin floor. It was formed by the eruption and subsequent collapse of a 7,000-foot volcanic mountain on the Alaska Peninsula. Congress recognized the unique geological significance of the caldera by designating it a wild river within the National Wild and Scenic Rivers System. Within this deep, lava rock filled crater is Surprise Lake, source of the Aniakchak River. Having the opportunity to hike into Aniakchak's caldera and packraft out the river through the gates was a otherworldly and humbling experience. First it is logistically an incredibly difficult place to get to, it is in the roadless western Alaskan wilderness with the small village of Meshik or Port Heiden approximately 20 miles to the west. After fishing in the Bristol Bay salmon season it was a short bush plane flight with two friends to Port Heiden. Looking fresh and all to clean at the start of our hike into the caldera. We Hiked the 26 miles to the shore of surprise lake over two days. The first day was mostly great walking on hard tundra but as expected we ran into some serious rain and wind. The higher we climbed on the approach to the caldera rim the vegetation dwindled until we were in a lifeless land of volcanic rock. One of the minor stream crossings as we made our way up the rim. As we neared the slope up to the final push the clouds came down to greet us, socking us in completely. Making our way over the rim the second day, we were in a complete whiteout navigating over this dynamic landscape by GPS trying to find the route over the rim. Last clear view of the rim before the weather came in. As we neared the slope up to the final push the clouds came down to greet us, socking us in completely. 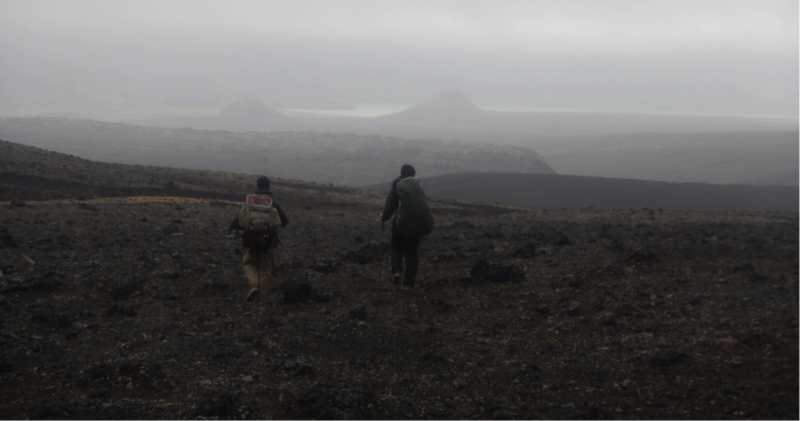 Clearing up as we cross the calderas lava flows to surprise lake barely visible in the background. We camped at surprise lake on the second day and finally had a minor break in the weather. There are some iron rich warm springs the flow into the lake making a dramatically colored lake shore. Shores of surprise lake from atop a nearby cinder-cone. After reaching the lake I would continue on down Aniakchak River and my two friends would return the route we came in. The first mile out of surprise lake is calm but as soon as the river cuts into the caldera wall through “The Gates” it plunges through 15 miles of continuous rocky Class II to IV rapids. The Aniakchak River drops more than 1,000 feet in the first 15 miles leaving the caldera at a gradient around 75 feet per mile. Spawning runs of sockeye salmon fight their way up the Aniakchak River and into Surprise Lake, the river's shallow head-water lake inside the caldera. In addition to rapids, hazards include winds up to 100 miles per hour that can damage tents and other equipment and prevent airplanes from landing at the lake, a dense brown bear population, sharp rocks in the river lead to many punctured boats. These and other limits reduce the number of parties floating this river to only a few per year. Starting the drop through, looking at the south facing slope of the gates. Boulder strewn continuous class III-IV all the way through the gates. Looking Back at the gates a few miles down river. Scouting last major rapid around a blind corner, of which there were many like it. After paddling nearly halfway to the Pacific Ocean on the Aniakchak River you have what looks to be a packrafter's ideal 3 mile portage over the continental divide to Meshik Lake, the headwaters of the Meshik River that winds over 50 miles back to Meshik village. However, it requires some bushwhacking, route finding, and crossing overland through very thick bear country. There is also a very distinct landmark, Pinnacle Mountain, that you cross just to the south of that guides you right to the lake. I camped on the shores of Meshik Lake on the third night. Crossing the shallow lake and trying to find its packraft sized outlet to the main stream was challenging when 25 mile per hour headwinds kicked up early the next morning. 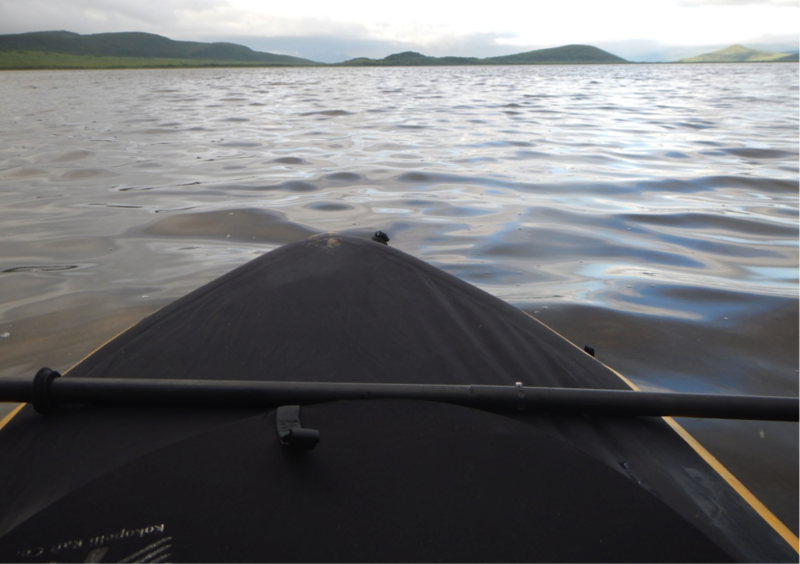 Paddling down the salmon filled Meshik River was two very long days. Sharing the river with dozens of grizzly bears is a challenging thing for a solo person. After paddling about 30 miles into a persistent headwind I camped on an island in the middle of the river attempting to avoid the shoreline which were covered in huge coastal grizzly tracks. The first of many encounters with the grizzlies, the channel was only about 30 feet across at this point. Island camp on night four, trying to keep the bears out of camp. Sun and wind in the broad Meshik river valley, Aniakchak's snowy southern rim on the horizon. Shoving off the shores of Meshik Lake. The last day was a bit of a blur. I know I paddles another 15 or so miles mostly in the fog, dragged my boat through the tidal mud nearly getting stuck up to my chest, dodged grizzlies in the fog and coastal grasses, packraft portaged Birthday creek, then walked 11 miles through the coastal grasses up to my chest with super soft spongy marsh up to my knees for what seemed like eternity. I completed the 90+ mile loop in five long days and made it back to the village late on the 5th day. I then flew back to Anchorage from the Port Heiden airfield the next day grateful for the way the trip had played out. Most people who are guided on this trip and river end up paying multiple thousands of dollars while I was fortunate enough to be able to do it for a $25 buddy pass flight and some left over food from our commercial fishing season. Kokopelli packed and ready at the island camp the next morning totally socked in. Leaving the Meshik River through the tidal mud to start the last 11 mile leg backpacking overland. Last need for the boat is crossing birthday creek, too swift and deep to walk across safely. This trip provide fairly consistent class II fun that thankfully didn’t escalate much further in any of the scenarios it potentially could have. Thanks to the Kokopelli team for building such a reliable and whitewater competent boat. I didn’t have a single puncture the entire trip despite all the sharp lava rocks on this run. There was plenty of storage in the zipper system in the tubes for all my backpacking gear so that I could run the rapids low profile with a clear deck and a stable low weighted boat. All of the versatile whitewater accessory options my boat had are a complete must for a run of this caliber. Not many packrafts could hold up so well on such a difficult and challenging trip.